A new version of Microsoft Office designed for the iPad is rumored to arrive on the App Store soon, as hands-on impressions with the suite have been shared online, though Microsoft has called the information "inaccurate" [updated]. 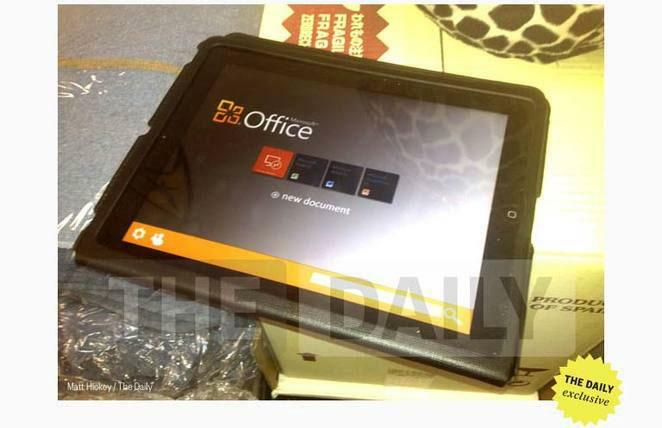 News Corp's The Daily for iPad offered the first glimpse at Office for iPad on Tuesday. Author Matt Hickey got to spend some time with a "working prototype" of the productivity suite, which features Microsoft's trademark "Metro" design found on Windows Phone and the forthcoming Windows 8. "Word, Excel and PowerPoint files can be created and edited locally and online," he said. "But it's unclear if Microsoft will support other Office apps at launch or at all." The design side of the project is said to have already wrapped up, but an exact launch date remains unknown. It was said that the project "could be released in the coming weeks." Update: In a statement to The New York Times, Microsoft has said that the original story "is based on inaccurate rumors and speculation." The company declined to give any further comment. The original report cited anonymous sources in adding that Microsoft Office for iPad will "soon be submitted to Apple for approval." No pricing or other details were provided. While Office is coming to iPad, Microsoft reportedly has no plans to bring its suite to competing tablets running the Google Android mobile operating system. The Redmond, Wash., company is also said to be planning an update to its existing OneNote application for iOS to add a Metro user interface. The Daily first indicated last November that Microsoft was preparing a new version of its Office suite for Apple's iPad. In addition, an updated version of Office for OS X Lion users was also revealed, and is expected to become available on Apple's Mac App Store. Apple currently offers its competing iWork productivity suite on the iPad as three standalone applications. Pages, Keynote and Numbers for iPad, iPhone and iPod touch are each available for $9.99 on the App Store.